Just squeeze the pouch and sip the milk through the straw. The typical 8 oz. 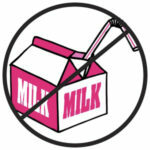 milk serving is a perfect application for the new Stand Up SqueezyStraw™ Dispensing Pouch packaging technology. Low cost, easy to use, easy disposal, high-speed production, and the elimination of the need for any other item such as a straw or cup make the Stand Up SqueezyStraw™ Dispensing Pouch the ideal package for milk. 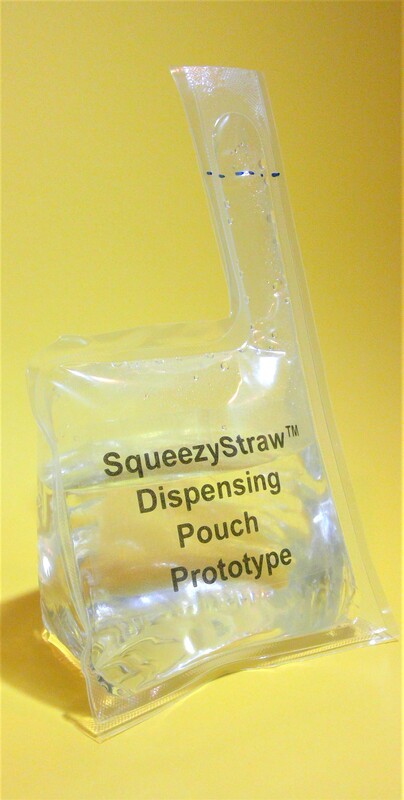 The Stand Up SqueezyStraw™ Dispensing Pouch is less expensive than the typical paper carton, which costs about 6¢ each. 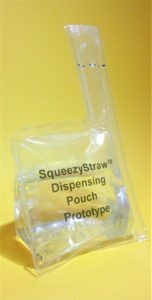 The Stand Up SqueezyStraw™ Dispensing Pouch, made entirely of low cost, light-weight flexible packaging materials, is estimated to cost less than 4¢ each in large volumes (50 million+ packs/year), including the patent royalty. 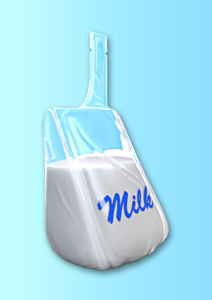 Stand Up SqueezyStraw™ Dispensing Pouch allows for maximum milk evacuation and compresses into a small mass when empty for efficient and low-cost disposal. Stand Up Squeezy Straw™ Dispensing Pouch is produced on a horizontal thermoform / fill / seal machine equipped with die-cutting capabilities such as Multivac. The 8 oz. prototype shown at left above was produced on a Multivac (www.multivac.com), estimated to cost $500,000 to $1,000,000, depending on production requirements. The high speed version of this machine can produce up to 250 packs a minute, depending on product viscosity.